Boy, there are a lot of these! I didn’t know what I was getting myself into when I first started writing about common homophones. But here we are on the Ts. Well, there are lots of t-homophones, so this is the first half. Homophones, remember, are words that sound alike, but have different spellings and definitions. 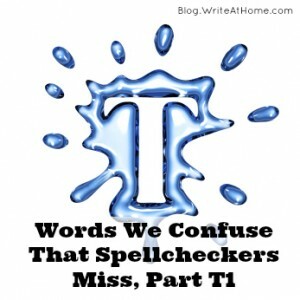 They cause problems for spellers because they aren’t caught by spellcheckers. These are words you just have to learn by heart. T is the letter, but it is sometimes spelled tee. Tea is the brewed beverage. Tee, when not referring to the letter, is a device for supporting a ball in sports. Tees are used for kicking in football, for hitting in t-ball (baseball), and for driving the ball in golf. The grassy area from which balls are initially struck in golf is also called a tee. Walter finished his tea, changed out of his t-shirt, and headed to the first tee for a morning round of golf. Tacks is the plural of tack, a short, sharp nail. A tax is when people take money from you (but it’s not illegal because the people taking it also make the laws). Carpet layers are angry because Congress just set a 2% tax on tacks. The protuberance on the hind end of some animals is a tail. A tale is a story. Have you heard the tale about how the peacock got its tail? If something tapers, it gets narrower toward its end. A candle with a tapered shape is known simply as a taper as well. 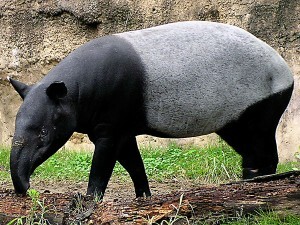 A tapir is an animal that looks like a pig with a long nose. The nose of a tapir tapers. Tartar is recrystallized product yielding cream of tartar on further purification. Tartar can also refer to an inhabitant of Tartary or a violent, short-tempered person (as people from Tartary were considered to be). To a dentist, tartar is a build-up on teeth. The word tarter, however, is the comparative form of the adjective tart. After the dentist cleaned the tartar from my teeth, food began to taste tarter than before. Taught is the past tense of the verb teach. I teach today, yesterday I taught. Taut means “pulled tight,” like the skin on a drum. The old rancher taught the young buck to keep the fence wire taut. The scuba diving team explored a reef teeming with anemones. Tear is a heteronym; it can be pronounced /teer/ and mean one thing or /tare/ and mean another. In the former sense, tear is also a homophone with tier. A tear is what our eyes emit when crying. A tier is a level in a hierarchy or, in the physical sense, in a stadium, arena, or auditorium. The theater was so well-designed that those sitting in the uppermost tier can still see the smallest tear on an actor’s face. The second pronunciation of tear (tare) is a common noun meaning “a hole or rip made from tearing” or a verb meaning “to separate or pull apart by force.” A tare, however, is an old-fashioned word for a weed in a grain-field. It is used in some parables of Jesus in the New Testament. The farmer will tear every tare from the ground. Tense is an adjective meaning “under stress” or “made tight.” The plural of tent — a structure typically made from cloth for temporary shelter — is tents. Mary is afraid of bears, so she is always tense when she sleeps in tents. The common word is turn. It can be a verb that means “to change direction.” It has a noun form as well. A tern, on the other hand, is a kind of sea bird. The loud noise caused the tern only to turn his head. Someone or something from Thailand is referred to as Thai–a proper adjective. Tie is a versatile word that can be used as a verb or noun. Men wear ties with suits. To put it on, you tie it around your neck. My parents traveled to Asia and brought me back a Thai tie. Their is a possessive pronoun. When you are referring to something possessed by a group of people, use their. When indicating location, use there. There is also correct in sentences such as There is no place like home. When you need the contraction for there are or there were, use they’re. Where are the Hunts? They’re there in their car. Threw is the past tense of the verb throw. Through is the preposition showing how something might move. Manning threw the touchdown pass through the arms of the defender. A violent spasm is a throe. The more common word meaning “propel through the air” is throw. The game-winning throw sent fans into throes of jubilation. A monarch sits on a throne. Thrown is the past participle of the verb throw. After King George had thrown a tantrum, he sat in a huff upon his throne. Thyme is a flavorful herb. Time is the concept measured by clocks. This dish will be a little bland because I don’t have time to run to the store for more thyme. Bloggers always appreciate comments. Feel free to leave yours below. Do Continual and Continuous Mean the Same Thing?